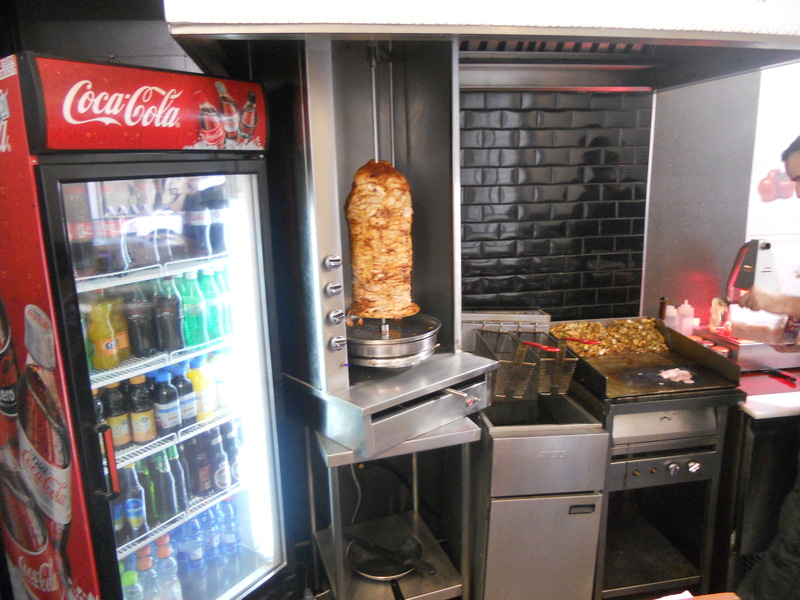 As promised, I visited the shwarma store located in the Old City of the capital, at 5 Beit El Street. 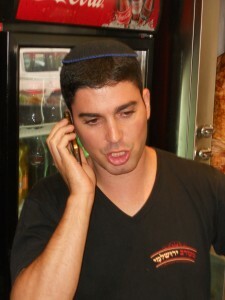 I met with owner Yaron Sheetrit, a young man in his 30s. I spent about two hours speaking with Yaron, and I feel compelled to mention how impressed I was by this young man’s integrity and commitment to running his store in accordance to Halacha. I do not attest to being an expert in judging people, but this young man shines, truly an exception. He decided after two years of operating under the Jerusalem Rabbinate mehadrin that he did not have to continue paying for the service and enlisted his rav, Rabbi Chaim Shapira of Baka to assume the role of mashgiach. The rav agreed and he visits the shop daily as the two learn together at the store. 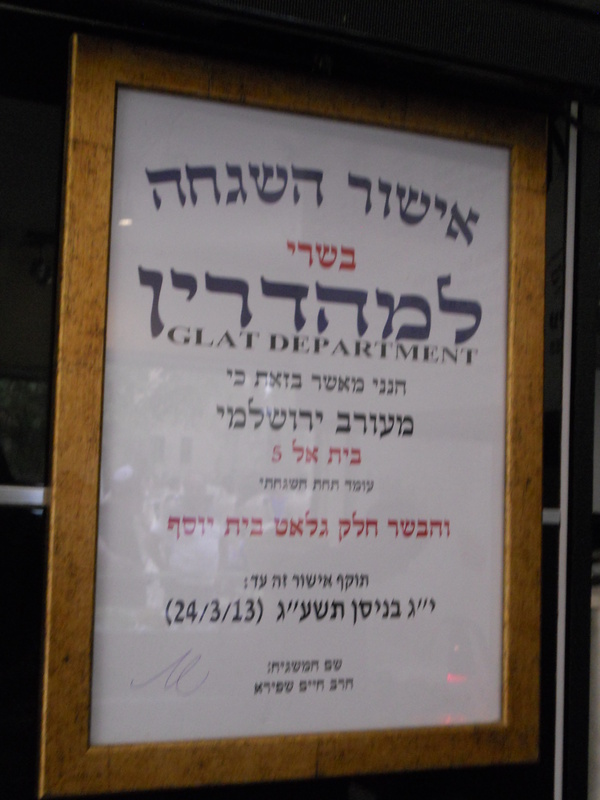 The rav runs a small kollel in their shul, Heichal Baruch, located at 16 Yehuda Street in Baka. The kitchen of the store, which is quite small, was opened to me as was the entire store. I was shown receipts and delivery slips to back up Yaron’s claims regarding the origin of the products he uses. All the meats and poultry are the shechitah of Rabbi Mutsafi. 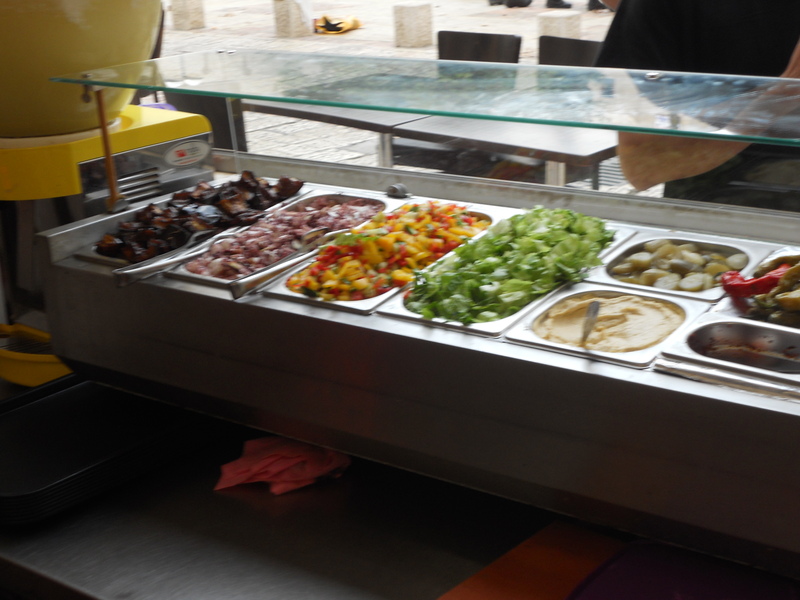 The other products, including the salads (humus, techina and so-forth), chopped salads, pitot, falafel balls, spices, soft drinks, lemonade in a dispenser are one of the Israeli “badatzim” including Rav Landau, Eida Chareidit, Beit Yosef, Belz and Badatz Mehadrin (Rabbi Rubin). Only Jews are employed in the store, simplifying matters somewhat. Yaron is shomer shabbat although not all workers are. He also does not sell livers or hearts, eliminating concerns surrounding the preparation of these items. 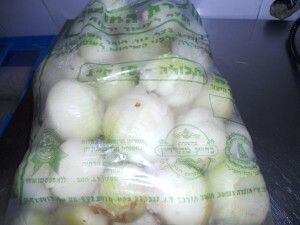 There is no ‘linat laila’ (לינת לילה) as the peeled onions come coated with oil, which satisfies this according to some poskim. Those greens requiring washing are washed as well. For whatever reason, he has a separate fryer for falafel balls so they are indeed parve, until you bring them to the front and mix them with the other components, turning them to ‘chezkas basari’ but that is the way he like to do it. The chips are fried in the oil used for the poultry so no parve option there. The store is quite small, modest in size and the operation relatively simple from a kashrus restaurant point of view. This young man is somewhat of a surprise, and if you meet him and speak with him this will become evident early on in a conversation for other than his wife and children, his passion surrounds the shul in which he serves as a gabbai, and his kiruv work, some of which surrounds his store. The store closes down at 16:00, at which time he hosts a mincha minyan and he works hard to find the young folk he believes may not daven otherwise. The store is closed on Fridays in the winter as well as motzei shabbos, as Yaron explains there is too much to do surrounding shabbos, so he cannot be in the store. He does not want to ruin his shabbos afternoon worrying about running to the store after havdola. For me, I say the store seems in order and if the standard detailed above works for you along with the hashgacha of Rabbi Shapira, then your set. A final note: At my behest, he changed his teudah since I explained the other one was too similar to the Jerusalem Rabbinate mehadrin and some people may not notice it is not. He apologized and agreed, and made the change. 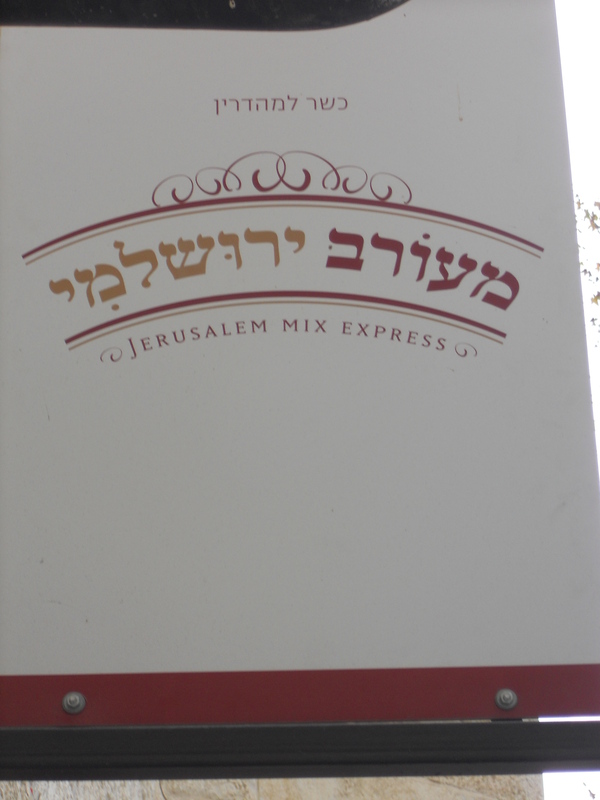 I was hoping for something that differed more, but the photo below is the new one which at least does not have the same fonts as the Jerusalem Rabbinate mehadrin as the first one did. Posted on October 24, 2012 by JKN Israel. This entry was posted in Restaurants. Bookmark the permalink. So does that mean that you are prepared to accept a system in which each individual’s LOR certifies his store as kosher? There is a very serious danger in having and enforcing rules…and then making exceptions. Standards and standard practice avoids much of the dangers inasmuch as they remove the need to make the kind of subjective conclusions that are being made here. What if someone else comes around who wants to run his/her restaurant along the same lines as Yaron (with comparable tangible “evidence”) but you know in your heart that you don’t trust them because, unlike Yaron, their personality fails to impress you?? Either we expect people in kashrus to follow the rules…OR WE DON’T…!? What about his legal obligation to have a rabbinate certificate? Still, why he doesn’t have even rabanut regila? And on top of that his rav. Why doesn’t his rav signs some kind of teuda assuming responsibility? Why in the past he chose to pay for bogus cashrut? What about the letter of rav neventsal the rav shechuna? Yechiel, in this post you are mechalek with yourself! Time after time you have stressed that any establishment, in order to be deemed kosher, needs a local rabbanut teudah. Any additional (valid) teudot supplement but don’t replace the rabbanut teudah. Whether the Baal habayis in a yiras shemayim or not has never been previously listed as a reason for not requiring a rabbanut hechsher. The question is really, is it legal for this establishment to list as kosher without a rabbanut teudah. If it is, it sets a worrying trend with the likes of Saar Mizrachi and friends issuing teudot as well. I do not wish to enter into the subject at present for there is a great deal to be said for and against. What I do wish to throw in, perhaps food for thought, is the fact that in the eyes of the law, most badatz hashachos are “illegal” with the exception of the Eida Chareidis, which preceded the Chief Rabbinate and I believe Sheiris Yisrael. Yaron feels that therefore, using Rabbi Shapira, who is his rav, is no more or less legal/illegal than most businesses in the country. He is quite in the loop regarding the law. He checked it out. Like I said, food for thought. I conclude by adding that what really needs to happen is the Knesset revamping the state kosher law. This is not on anyone’s agenda since the chareidim do not use it, most dati leumi are fine with a local rabbinate, and those in the middle lack political representation to get anything done. This is one of the items on the agenda of the Tzohar Rabbis if they ever gain control of the Chief Rabbinate. Until he retired, we had ,in Baltimore, a glatt koshererliche fleishig deli without any outside kosher supervision. This was because we all knew and trusted the baalhabos , who we knew to be a yiray shomayim. Kosher supervision agencies and government laws are second best, if that, in comparison to you knowing and trusting the erlich baalhabos. When the kosher world became too complex, the need for agents and laws became apparent. But it does not supercede an erliche yiray shomayim preparing the food that goes into my mouth. If his customers trust him, good. If he is trying to fool the public, then let the weight of the law crush him. Sorry Yechiel, on this one we part company. I try not to fuel controversy on your site but on this one I am absolutely with every word in the comment by Telma Mills above. This guy walked over you. And I am seriously unclear about what improvement you expect for the Mehadrin consumer from Rabbanei Tzohar. I can vouch for the presence in Baltimore of such a deli as Zvi Tusk refers to, when I lived there until 8 years ago. It surprised me when we first moved to Baltimore some years before that but everyone did assure me that the owner was entirely trustworthy. 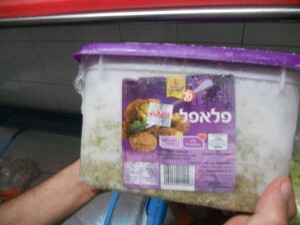 In North America, while there are several large kashrut overseers like OU & OK, but there are also many small agencies with only 2 or 3 mashgichim or even 1. They are respected [or not] based upon those who know the supervisors. people can ask their rebbeim about unfamiliar hechsherim. On the other hand, here in Israel, I have found that the major group which operates as a government funded agency – the Rabbanut – is typically not respected or trusted. If I wanted to eat at this or any other restaurant, I would first call the mashgiach. The first question I would ask him is if he himself eats at the restaurant. If he does not, then no other questions would be needed. If he does, then I might ask some others, but knowing he would eat there would help to convince me to patronize the place myself. I echo the comments of the others above. I just made aliyah from Toronto 6 weeks ago to Yerushalayim. Until recent years Toronto had the benefit of having ONE hashgacha – COR. Another one was brought in by the Chareidi community – Adas Yisrael a few years ago, and there was some friction but B”H they have learned to work together. But a phenomenon starting appearing recently in Toronto – private hashgachot from out of town rabbanim noone heard about. It was because the owners started to balk at what they had to pay COR for mashgiachs. So Toronto has also started to slip a bit into the New York style situation where “Haimeshe” hashgochos are all over. How do you know if it meets your standards unless you know the Rav or do your own private investigator routine that Yechiel often exhorts us to do (go into the kitchen and ask the mashgiach 64 questions.) Or rely on the “everyone” hasgacho aka “everyone eats there”. In my opinion, the purpose of standardized hashgacha agencies is in order that the public doesn’t have to be their own private investigators. That if they see the proper teuda on the door, they can depend on that. Unfortunately, it appears that Yerushalayim is descending into a freeforall of these teudot being constantly suspect. Until now, I thought Yechiel was mainly into investigating fraudulent teudot of accepted, recognized agencies and publicizing the fraudsters. Kol Hakavod on that. But supporting the owner of this schwarma place to go his own road into private hashgacha is another step to kashrut anarachy in Ir Hakodesh. Telma and Pith- Following the rules, is following the Shulchan Aruch. According to the shulchan aruch, everything is fine in regards to TRUSTING the owner. Nowadays that kashrus matters have become more complicated we don’t assume that a business owner, even a yirei shamayim, to be an expert in kashrus laws. That’s where Kashrus agencies bring their expertise. 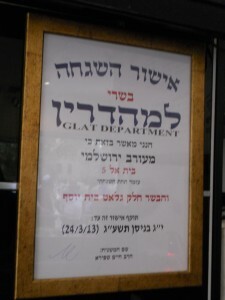 If one doesn’t recognize the agency or supervising rabbi, no one is forcing them to eat in a store like that. What Yechiel is happy to point out, is that there aren’t any obvious kashrus violations like you would find in a place with a fraudulent hechsher. And at the end of the day, the owner knows he will lose some customers that won’t eat there because they don’t recognize his rabbi. So let it be. It’s strictly a business decision as the customers he loses (for not trusting him, as they don’t know who he or his rabbi is) aren’t worth the thousands extra a month he would have to pay for a rabbanut PLUS a Mehadrin hechsher. Judah, I don’t usually get into talkback chains but I do not accept, and until now Yechiel has appeared not to accept, that somebody in intentional violation of the law can be expected to be trustworthy on other matters. To paraphrase Michael, I am neither equipped nor desire to ask 64 questions and for this reason there is a law and there are recognized authorities. Otherwise Monsey zah cahn. Is that considered to be a badatz level shechita? In terms of methodology, wouldn’t it have been better had you spoken with the owner before posting the first article? Rabbi Mutzafi is the Rav HaMachshir of a Mashcheitah near Beit Shemesh. His Hechsher / their products are not acceptable in any recognized Mehadrin establishment. To say, therefore, that this place now maintains a standard that is higher than that of the Rabbanut Mehadrin is inaccurate. Their products are significantly cheaper than Atara, Aguda, Rubin products which are the ones used by the Rabbanut Mehadrin facilities. Go figure. And I think it must be stressed (can’t be stressed enough?) that the fonts and layout of this Teuda are very misleading. It is very easy to change that (I’ll offer my services for free) and this guy has not. If, BH, there are many subscribers looking to be educated as Kosher consumers in the ISraeli market, it behooves you to maintain a standard of your own. You so eloquently state time and again that the JKN is here to identify different policies, laws, and Halachos – and then to let the reader decide which is for him – as long as the reality matches the claim. In this case, the reality does not match the claim (i.e. 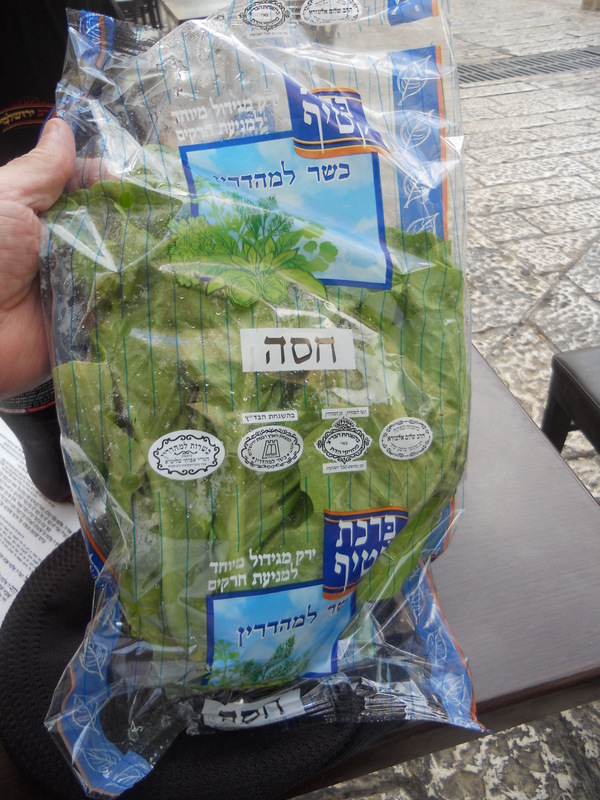 the shechita, the teuda, etc.). is Rabbi Mutsafi a good hecksher?. Perhaps an evaluation this deep, and a promotion this broad of a certain previous Chinese place in Beit Shemesh, would have prevented a plethora of sinas chinam and misery…. Dan Lkaf Zchus is a great midah. 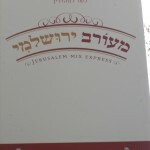 Yechiel, the tune of this website has sure changed, and I feel it is certainly for the better. You can easily get a false negative using this method. What if he won’t eat at some meat place because he is a vegetarian or he won’t eat because they cook with peanut oil and he is allergic? Or more importantly, what if he keeps some chumra and the restaurant doesn’t? How do you know without asking if you are maqpid on said chumra? I suppose that if a supervisor only eats at some place that keeps every chumra possible and the person speaking to him also only eats at such places, than the “do you eat there” question has some value. Otherwise, it is a very poor method. So I guess you’ve given up on standard hashgacha agencies? Imagine the bedlam that will result when restaurants hire their own personal rav as moshgiach and every time one wants to eat out, one has to check out each rav? Kashrut agencies may cost an owner some money, but that’s part of doing business. Why does Yaron seem to melt your resolve to campaign for standard hashgachos? To the above that claimed that nobody considers HaRav Mutzafi’s hechsher to be mehadrin. That is quite Ashkenazcentric of you.